Newson NV is a technology company specializing in high precision measuring and control engineering. We started off in 1988 as an engineering company. Over the years we accumulated a vast experience in all hardware and software aspects involved in signal measurement and control engineering. This experience found its way into a choice of high quality, leading edge products. CONtester™, a high tech measuring unit for stress-testing of electrical contacts was first launched in 1998. An improved version became available in 2004. In 2001 Newson patented the rhothor™ concept, setting revolutionary new standards in laser deflection. A family of products incorporating this technology is available for the OEM market. Newson production capacity is located in the Dijkstraat 84, 9200 in Dendermonde. Two original symmetrical twin mansions, designed in 1922 by architect Hubert De Maen, were completely restored and combined with new production facilities into a mixture of heritage and technology. The buildings in art nouveau style are part of the inventory list of architectural heritage, maintained by the Flanders Heritage Agency. Take the N47 in Asse towards Dendermonde. Cross the railway brige. At the roundabout take the second exit and drive on the Brusselsestraat. Follow the Vlasmarkt, Kon. Astridlaan and Dijkstraat. Newson is situated at the right hand side. Take the exit 12 "Dendermonde-Lokeren-Zele". 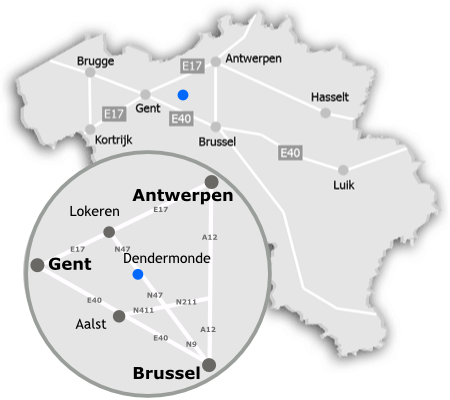 Follow the direction for Dendermonde on the N47 for approximately 10km. Cross the bridge over the Schelde and at the traffic lights continue straight on. Stay on the right-hand lane which turns right after 20m into the Oude Vest. Follow the parking lot indication and make a sharp turn right into the Papiermolenstraat. Follow this street into the single direction streets Werf and Koningin Astridlaan. Turn left into the Dijkstraat. Newson is situated at the right hand side.